The Netherlands is a land of water. The country has been shaped by its force and largely exists due to sound water management. A major example is the Zuiderzee, a large shallow inlet of the North sea consisting of multiple lakes, marshes and channels. As rising sea levels and storms made it bigger over the centuries, surges and floods caused death and disaster. These perilous waters have finally been tamed by closing them off from the open sea in the 1930s, creating a manmade freshwater lake. A big block of land has since been reclaimed for farming, housing and industrial development, but when the drainage of the lowest part was finally concluded in 1968, no one could have foreseen it would become one of Europe’s most important wetlands. Too wet for construction this part was planted with common reed, providing food and shelter for numerous (near) extinct species of waterbirds. Some of these species, as for example the Grey Goose (Anser anser), Great Egret (Ardea alba) and Eurasian Spoonbill (Platalea Leucorodia), returned in such numbers that the significance of this area as a major nature reserve was soon recognised. With the extension of a so-called dry zone in the 1980s the reserve started to develop its current appearance, especially after the introduction of Heck cattle, Red Deer and Konik Horses, the latter present in spectacular sized herds of up to 1,000 individuals. 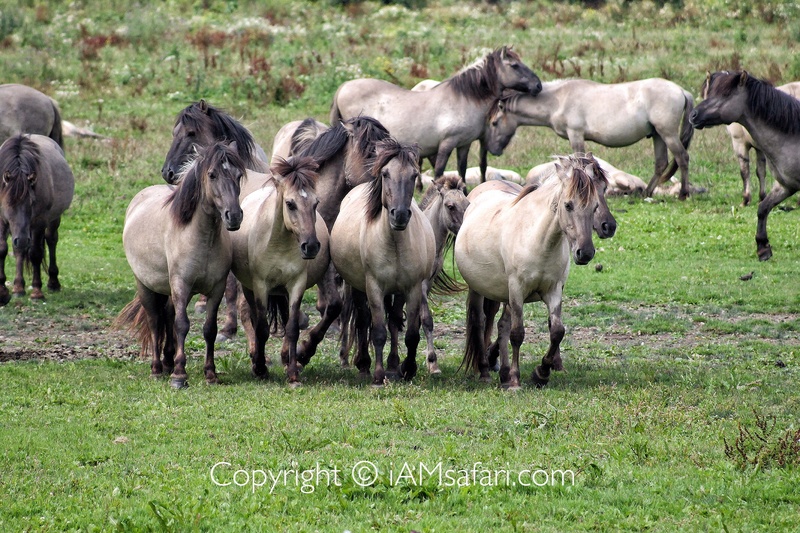 The Konik may be the most symbolic addition to what is now referred to as ‘The New Wilderness’, as this Polish horse is an effort to breed back the extinct Tarpan (Equus ferus ferus), a wild horse that once roamed the steppes of Europe and Asia like its cousin, the Przewalski (Equus ferus przewalski). 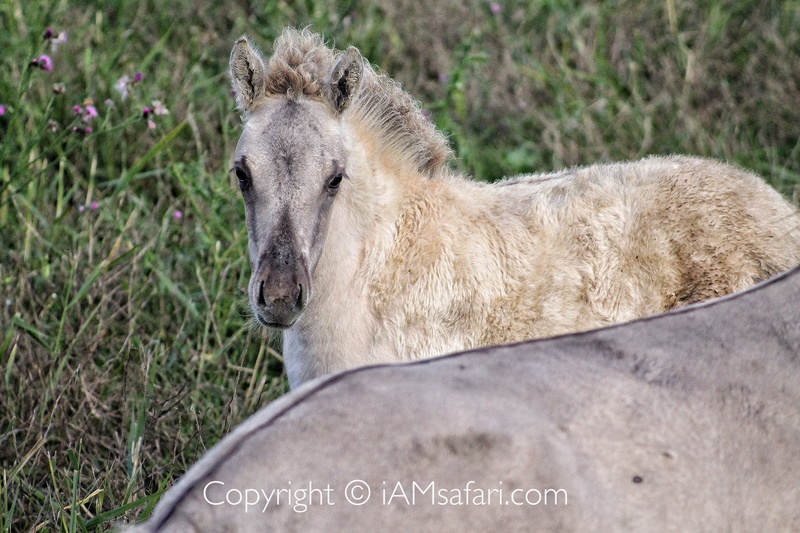 Although the Konik possesses some primitive markings as a dorsal stripe and dun coat through strict selection of foundation animals, it still has traits of domesticated horses. 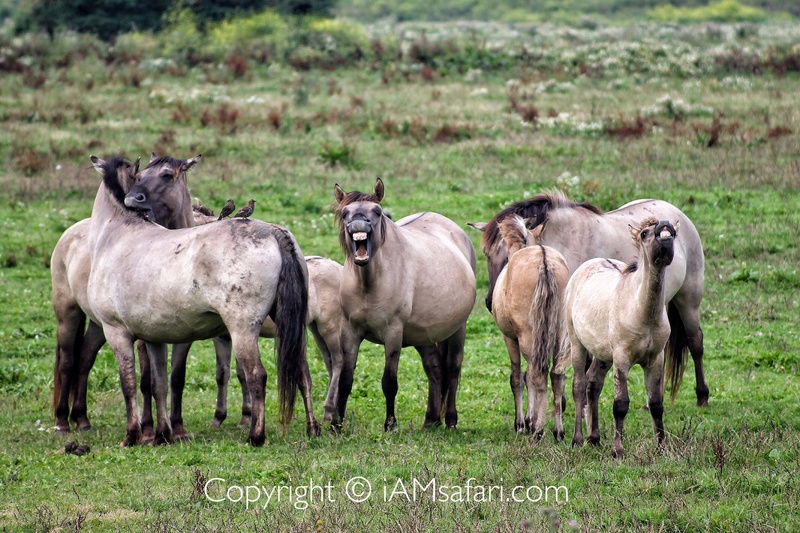 However, physical appearance doesn’t make them tame, in contrary, these animals display the unpredictable behaviour one can expect of wild animals, including fierce battles between dominant stallions. Furthermore, the size of the herds fluctuates naturally during the seasons, adjusting to the availability of food sources and with a considerable number of individuals not living to see the end of the winter. The spectacle of nature has been restored in its full glory, a remarkable achievement in one of the most densely populated countries in the world. Looks like Oostvaardersplassen affords one a fascinating glimpse into the Europe that existed before man’s onslaught on the natural world Maurice? Thanks for the like and comment! Absolutely true, never seen such a concentration of wildlife in a relatively small area. Maybe more fascinating in this case is the resilience of nature – although human intervention has been necessary. Have a look at the trailer of the just released movie, now showing nationwide. Hundreds of Horses and more animals are trapped in several Dutch parks. The Horses are domesticated, and breed on and on. People think they are wild, they are not, they are trapped domesticated draft Horses which are the result of a human selection. Humans tried to breed an extinct specie, the Tarpan. But no human ever was able to breed back an extinct specie, ever. A movie of the reality, and it goes on and on. Please help us, help them, the innocent animals who have to pay an enormous price for humans dream. They can’t speak or write in words, bu you can! Please, help them, and join us in saving these innocent animals. Thanks for your comments and discussion on this well debated topic. I agree that the sight of dead animals is not particular pretty, no matter the cause. Unfortunately animals do die in the OVP as in any other nature reserve. Both small and big animals, young and old. In the OVP dead carcasses are clearly visible as herbivores are large animals living on open grasslands and marshes. The mortality of herbivores in the winter of 2004-2005 has sparked off a debate on animal welfare and ecological management. In response to several contrasting advisory reports a committee of international experts (ICMO) has been established to advise on the further management of large herbivores in the OVP. ICMO agreed unanimously that some form of human intervention was necessary to fulfill animal welfare standards, despite the fact that a mortality of up to 30% of the entire population every winter is natural. In the severe winter of 2009-2010 this rate was 25%, in 2010-2011 an estimated 20%. In order to avoid a rigorous intervention in the natural processes of population regulation and natural selection and the killing or removal of a substantial number of young and healthy animals, ICMO considered a reactive culling strategy most feasible. This strategy involves the monitoring and culling on a daily basis of all animals whose physical condition has declined to a set level defined by established welfare criteria. This approach which minimizes the off take of healthy individuals has now been implemented and is accepted by the both the public and animal welfare organizations as the best solution. Now up to 90% of the total annual mortality is due to reactive culling. Unfortunately the OVP is too small to apply a policy of no intervention in which no animals have to be culled. However, every nature reserve in the world – Serengeti included – has a carrying capacity allowing a set number of certain species within its boundaries. During the great migration up to 250,000 Wildebeasts die as they are to weak to survive. Seasons and nature fluctuate and so do animal populations. It’s simply natural.